We offer unique, personalized, and boutique sailing charter experiences throughout the Windward Islands of the Caribbean, from St. Lucia down to the Grenadines and Grenada, which are some of the most beautiful, untouched, and pristine parts of the Caribbean. The Grenadines are called the “jewel of the Caribbean” for a reason, with sparkling waters, hundreds of islands (many uninhabited), and comfortable, enjoying sailing yachts. Each package below offers a different destination and length of charter, whether you’re looking for just a couple says around a certain island, or a week-long cruise through the Grenadines. Each charter package has a selection of yachts, catamarans, and crews. Set sail to St. Lucia, Martinique, or the beautiful Grenadines & Grenada. Suggested itineraries for the best places to see, but still personalizable to you. We have a seasoned, well-maintained fleet of yachts, catamarans, and crews. Crewed/skippered for safety and comfort, so you can relax and enjoy the trip. Experience the majestic island of St. Lucia the best way possible - from the sea. Set sail from Marigot Bay to visit some of the best spots in St. Lucia, including the Pitons Mountains. Sail to Martinique and see for yourself the island's enchanting French-Caribbean culture with delectable cuisine, lovely beaches and snorkeling, and volcanic landscapes. Referred to as "the jewels of the Caribbean", the Grenadines are a series of hundreds of secluded, sandy islands, mostly uninhabited, and surrounded by sparkling Caribbean waters. Our most popular activity; a single day of sailing down from Marigot Bay to the Pitons Mountains, where you can hop ashore to explore the local attractions. Enjoy some snorkeling along the way; lunch & rum punch included. Runs every Tuesday, $100/pr. Read more. An incredible, all-inclusive experience. Enjoy this hassle-free sailing charter through the beautiful Grenadines islands of the Caribbean, where meals and drinks are included on your own beautiful, state-of-the-art sailing yacht. For 2 - 4 people, starting at $804/pr. Read more. The perfect taste of the Grenadines, taking you to St. Vincent, Mayreau, Young Island Cut, and the beautiful, Tobago Cays. At only 5 days/4 nights, this charter still lets you balance your vacation with a few nights onshore at a villa. For 2-10 people, starting at roughly $1,125/person. Read more. Sail from Marigot Bay down the west coast of St. Lucia to see the Pitons, Diamond Waterfall, Botanical Gardens, Active Volcano, and more. Stop to snorkel along the way and enjoy lunch and rum punch aboard. 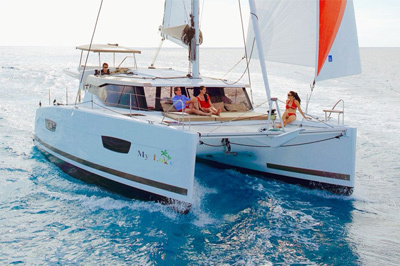 Available as group or private, monohull or catamaran Read more. Sail from Marigot Bay up the west coast of St. Lucia to Rodney Bay and Reduit Beach where you can enjoy lunch ashore, some time at the beach, or a visit to the national park and old fort. Available as group or private, monohull or catamaran. Read more. Leaving at around 5pm, our sunset cruise departs from Marigot and takes you for a romantic sail by the calming evening wings. Enjoy complimentary sparkling wine and hors d'oeuvres while on board. Upgrade to make it a private cruise. Available as group or private Read more. Essentially our two day sails combined into a short, easy charter with one overnight. See the best spots on the island, including Rodney Bay to the north and the Pitons to the south. Available yachts: catamaran Read more. Sail from Marigot Bay up to Rodney Bay to explore the area. Next day, sail south, stop to snorkel at Anse Chastanet known for its amazing reefs. On the last day sail to Soufriere and the Pitons before sailing back. Available yachts: monohulls or catamaran Read more. Sail from St. Lucia to Martinique and discover some of the most popular and hidden treasures of Martinique, including Forte-de-France (the 'Paris of the Caribbean') as well as some beautiful little local fishing villages and quiet beaches. Similar to our Martinique Mariner Charter but with a bit more time to enjoy Martinique, such as a stunning black beach by the name of Anse Noire. There's plenty of exquisite restaurants and even a casino you can visit along this trip. Available yacht: monohulls or catamaran Read more. As the name suggests, this short itinerary gives you a great taste of the Grenadines and four of its beautiful islands, including St. Vincent, Young Island Cut, Bequia, and of course, St. Lucia. A good choice if you'd like to split your vacation between land and sea. This charter gives you just enough time to sail and experience some of the truly authentic Grenadines islands like Mayreau, Young Islands Cut and the gorgeous Tobago Cays with its pristine protected reefs, uninhabited islands, and secluded beaches. A true sailing experience. Start with one night on the northern Rodney Bay of St. Lucia before heading to Martinique the next day. Then enjoy a lovely 5 days sailing and exploring Martinique, including the iconic Mt. Pelée sleeping volcano. Everything you need to see in the Grenadines - St. Vincent, Bequia, Palm Island, Tobago Cays, Union Island, and more. All the time you need to relax aboard and ashore; beautiful emerald waters, secluded beaches, pristine snorkeling, and so much more. If you love the sea and want to explore two very unique incredibly beautiful Caribbean islands - being St. Lucia and Martinique, this combo charter is a wonderful option. You'll see the best spots of both islands that only the sea can bring you to. The itinerary that will give you the most sailing time in the Grenadines. Enjoy plenty of time cruising through the archipelago known as the jewels of the Caribbean before taking a flight back from Grenada to St. Lucia (saving you from sailing back). We invite you to set sail on a unique and luxurious Caribbean sailing vacation aboard this spacious, stable, and airy catamaran. Deserted islands and beaches, unspoiled Caribbean settings, and a brilliant French chef will make your voyage unforgettable! This charter is aboard a 40' catamaran for up to 4 people. Read more. When you make an inquiry or a booking for a sailing charter, you can choose which type of yacht you would prefer, whether it be a monohull, catamaran, or our all-inclusive option; 'Silent Wing'. Some yachts have specific crew & captains while others can change depending on scheduling and whereabouts of the charters. A mono hull yacht used for our day-sail tours and sunset cruises in St. Lucia, based in Marigot Bay. A slightly larger mono-hull yacht and a very nice boat, accommodating up to 8 guests plus crew. A stylish modern yacht and with plenty of space at 50' long. Can accommodate up to 6 guests plus crew. Large, beautiful, spacious catamaran. Can accommodate up to 10 guests but sleeps 6 most comfortably. An all-inclusive, spacious and enchanting catamaran with crew members, Faye and Mike.